The Air Pollution Control Bureau is a regulatory agency for outdoor air quality. We regulate various types of companies and issue permits outlining the rules for their emissions. We issue four primary types of permits: asbestos, industrial, gasoline dispensing facilities and dry cleaning facilities. The most significant way that the Air Pollution Control Bureau controls air pollution in Hamilton County is by permitting facilities that are potential sources of air pollutants. All industry operating in Hamilton County that have the capability to emit any air pollutant is required to obtain an air pollution permit. This permit may be in the form of a Certificate of Operation for minor and synthetic minor pollution sources or a Part 70 Operating Permit for major sources. The Bureau engineering staff address all permitting issues for the companies to which they are assigned, conduct annual inspections, track air emissions and develop special operating conditions to ensure compliance with the applicable rules and regulations. As mandated by Title V of the Clean Air Act Amendments of 1990, the Bureau implemented an operating permit program that applies to major sources of air pollution. 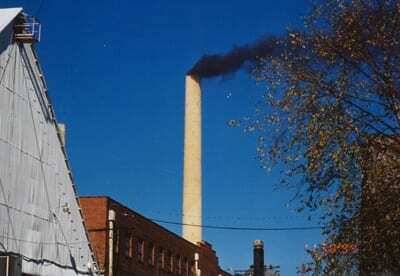 In 1996, the EPA approved the program. In addition, Congress required that a fee structure be put into place to have the major sources pay for the administrative costs of the permit program, thus shifting the burden from tax payers and placing it on the sources of air pollution. Any other source the EPA Administrator determines by rulemaking should be included. * Certain companies are required by EPA to keep their major source status even if they no longer pollute at major-source levels. All industries that are potential sources of air pollution, unless specifically exempt as determined in the Air Pollution Ordinance, Section 4-56(c)(11) and (12), must receive an installation permit before constructing, installing, or reconstructing any equipment that has the potential to emit air pollutants. Installation permits contain emissions limitations and operating requirements that must be agreed to by the source prior to receiving the permit. A Certificate of Operation must be issued or a Part 70 permit application must be received prior to operating the equipment. In addition, all installation permits, with the exception of New Source Review (NSR) cases which may require more time, are required to undergo a 30 day public participation opportunity period. For additional information, contact the Bureau Engineering Manager at 423.643.5978. The Air Pollution Control Bureau permits gas stations for Stage 1 Vapor Recovery Systems to reduce the release of pollution into the air and conducts annual inspections to ensure compliance. The Air Pollution Control Bureau is required to permit and inspect annually, any dry cleaning facility that uses perchloroethylene by the National Perchloroethylene Air Emissions Standards for Dry Cleaning Facilities. The Air Pollution Control Bureau permits and performs annual inspections of major industrial sources that have the potential to emit air pollutants. To determine your source status, please see the Industrial Source Definitions section above. The Air Pollution Control Bureau permits and performs annual inspections of minor/synthetic minor industrial sources that have the potential to emit air pollutants. To determine your source status, please see the Industrial Source Definitions section above.